Adding more keywords can help you narrow down your results and get very specific pages, but you have to be careful because many simple search engines may not interpret those three words, or the relationships between them, as you might want. When using three or more keywords it is often best to use engine that will allow you to use Boolean logic operators to define the relationship between the words. To narrow down your results and to get more specific you can add more words. Two or more keywords separated by the Boolean operator AND (all three letters capitalized) will tell the search engine that every keyword must be on the page. Example: The Boolean logic expression canoe AND kayak will ensure that the engine uses both words in its search and ranking logic and that both words appear on the pages returned. If you want to broaden your search to find documents which contain either of the keywords, use the OR operator between words. This is very useful when searching for a term which has a synonym that might be used in a document instead. An example is lesson OR tutorial, which would return any document which had either of the words. This operator is a more specific form of the AND operator. It ensures that the document contains both terms and that they are located near each other (within a certain number of words). In many lengthy documents, just using the operator AND might not provide useful results as the two keywords might be located in very different parts of the document and might not be related to one another. Example: The expression resistance NEAR antibiotic used in Alta Vista's advance search engine will ensure that the engine uses both words in its search and ranking logic and that both words appear within 10 words of each other on the pages returned. The operators AND, NEAR, OR and AND NOT are powerful in their own right but when used in conjunction with parentheses, they can offer substantial control over the search logic executed by the engine. Parentheses are used in Boolean logic similar to the way they are used in a mathematical equation, limiting and ordering relationships between variables. The most common use of parentheses is to enclose two possible keywords separated by an OR operator and then linking those enclosed/possible keywords with other keyword using AND. Here's an example: If you want to find a web-based internet tutorial you might use the search criteria internet AND (tutorial OR lesson). The documents returned must contain both of the words internet and tutorial or.... internet and lesson. Essentially, the parentheses are used to distribute the keyword internet to either of the two "OR" words inside the parentheses. If you did not use the parenthesis and used the expression internet AND tutorial OR lesson the word internet would only have to be present on a page with the word tutorial. A page with just the word lesson would be returned as well. NOTE: Using the OR operator outside parentheseis does not distribute the word outside parenthesis to words inside. Example - internet OR (tutorial OR lesson) will not ensure pages have internet and either tutorial or lesson. The search in this case could yield pages that have any one of the three keywords. 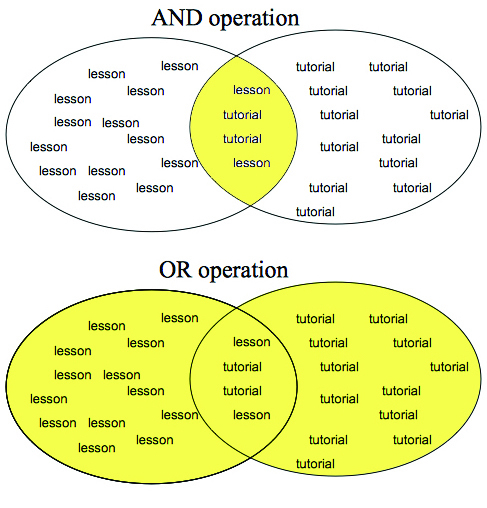 Also NOTE: The phrase internet OR (tutorial AND lesson) is essentially the same as internet OR tutorial AND lesson. All documents would have to have internet or..... tutorial and lesson. TIP: Each left side parenthesis must be paired with a right side one somewhere in the Boolean expression or the search engine will get confused (see how stupid they are!). If you make this kind of mistake many engines will return the message "syntax error"